Visitors to the 42nd Edmonton Motorshow enjoyed delicious appetizers, pleasant entertainment, and hundreds of exciting next generation vehicles. In fact, there were so many exciting attractions on display, it was difficult to experience it all in a single day. But, if you were lucky, you would’ve found yourself in Lincoln’s portion of the venue. There, your eyes couldn’t help but find themselves glued to the all-new 2018 Lincoln Navigator. It would’ve been hard to miss; the 2018 Navigator is an absolute behemoth, but that isn’t a bad thing. Its colossal size gave the Navigator more space to hold a record amount of cargo and sophisticated technology. As well, its larger size gave it a bigger canvas on which to display its refined design. Considering the increasing popularity of crossovers, it was refreshing to see the Navigator didn’t compromise its size to blend it. The 2018 Navigator continues to uphold the original principals of SUVs: power, utility, and tons of useable space. By and large, the most astonishing part of the 2018 Navigator is its interior. The only way to add more class to this vehicle would be to hang a diamond chandelier from its ceiling. Each trim is built with rich, top-quality materials, and each is thoroughly equipped with the most state-of-the-art tech and entertainment options. It’s so nice, you’d expect it to come with Michael Caine character as a standard personal chauffeur. In terms of technology and entertainment options, Lincoln left nothing to be desired. Every model has 4G LTE Wi-Fi hotspot that can support up to ten devices at a time, and can be accessed from up to fifty feet away. There’s a Revel Ultima Audio System that, with twenty strategically placed speakers, elevates your Lincoln to a verified concert hall. What’s more, a 10-inch LCD touchscreen infotainment system is compatible with Apple CarPlay and Android Auto. That will allow you to operate navigation, make calls, listen to music, and perform dozens of other actions seamlessly, without risk of distraction. In addition, an available Head-Up Display can be installed. It projects important driver-related data, such as the speed limit and road conditions, directly onto the windshield. Unlike competing makes, Lincoln uses digital light projection (DLP) technology in its Head-Up Display. That allows the display to be visible in more ambient lighting conditions. If you have kids, you’ll be happy to know that the 2018 Navigator can be equipped with a rear-seat entertainment system that’ll keep the little ones silent and content on the longest road trips. As you sit comfortably in sculpted leather seats, your kids can stream content wirelessly onto the 10-inch adjustable screens mounted on the rear of the front seat headrests. There won’t even be any arguments about which movie to watch, either, as each screen can display different content. Beyond all that, drivers can enjoy a panoramic vista sunroof, unrivaled legroom in all rows, and best-in-class cargo space. Folding the second and third rows of seats is as simple as pressing a button, and it opens a world of possibilities when it comes time to pack up for your summer camping trip. Plus, with an available tiered cargo management system in the rearmost cargo space, you can configure the shape of your trunk space to handle the most oddly-shaped and unruly objects. This year, the Navigator gained a brand-new engine: a 3.5-litre twin-turbocharged engine. It’s paired to a slick-shifting 10-speed automatic transmission that helps improve fuel economy. Producing a jaw-dropping 450 horsepower and 510 lb-ft of torque (the same as the 2018 Ford F-150 Raptor), the Navigator’s engine dwarfs that of the Cadillac Escalade (that produces 420 horsepower). Equally impressive is the 2018 Navigator’s towing capabilities. With the twin-turbocharged engine and an engine-adapting standard tow/haul mode, the 2018 Navigator is armed with enough power to tow up to 3810 kg (8,400 lbs). That puts the 2018 Navigator right up there with the pickups in terms of pulling power. As a matter of fact, most people will argue the Navigator is more truck than SUV, and they make a pretty good case. It can tow like a truck, and it can haul like a truck. But more importantly, it was recently named the North American Truck of the Year at Detroit’s International Auto Show. Never mind just stealing market share from the zippy crossovers, the 2018 Lincoln has been making its name known in the trucking world, too. Outside, the 2018 Navigator is just as stunning as it is inside. Up front, it gains a massive – but still somehow attractive – grille with bright new LED headlights. The shape of the grille has a Bentley-like appeal to it. Plus, for extra style, it can come with an illuminated Lincoln Star built in. … and much more. These technologies will have your back in potential moments of inattention, and can save your life in dangerous situations. To summarize, the 2018 Lincoln Navigator, top to bottom, is an exceptional vehicle. 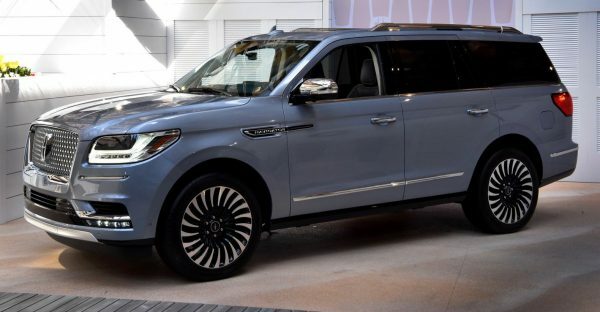 With a quiet and well-appointed interior, top-class entertainment and driver assist technologies, and a handsome exterior design, the 2018 Navigator succeeds in all metrics of luxury. Moreover, with the towing capacity and horsepower to rival a pickup, the 2018 Navigator succeeds in all things performance, too. All in all, the 2018 Lincoln Navigator was, by a long shot, our favourite luxury SUV on display at the 42nd annual Edmonton Motorshow. Finally, if you want to know more about what the Edmonton Motorshow had to offer, check out our blog by clicking here! Want to test drive the 2018 Lincoln Navigator for yourself? Visit GoAuto.ca or text 780.777.7777 to book in seconds, today! Stay Connected. Follow Go Auto on Facebook, Twitter, and YouTube!